Arms drop independently below seat level for safe lateral transfers. Easy-to-release mechanism may be operated by patients lacking manual dexterity. Arms automatically lock in raised position. Extra wide platform seat is comfortable for long periods of sitting. Welded steel construction and extra wide base provide added stability. Height readily adjusts from 19 ½" - 23", in 1 inch increments. 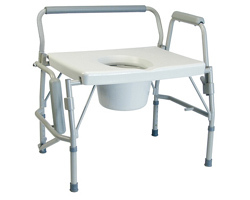 Comes complete with commode pail, cover and splash shield. Designed to met the requirements of HCPCS code: E0168. Width Between Arms 25 ½"
Seat Height Range 19 ½" - 23"